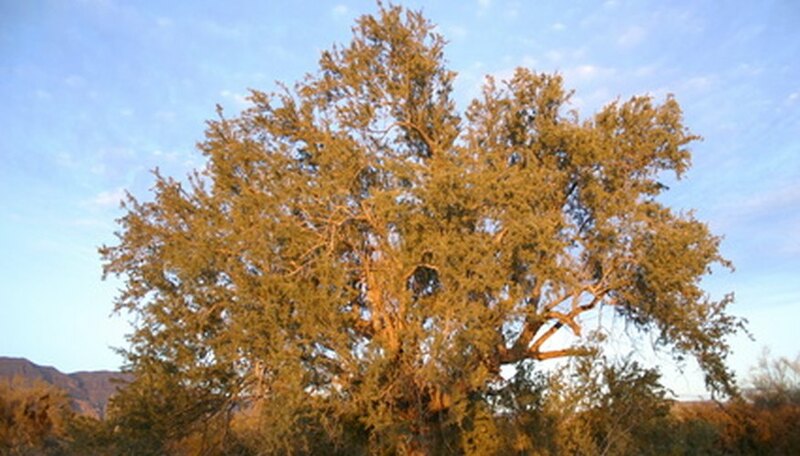 The mesquite tree grows 25 feet tall and has an airy, open-branched appearance. Common in many arid environments, the mesquite is prized by xeriscape gardeners for its extreme drought tolerance. Mesquites only reproduce by seed, according to the Texas A&M University. Though you can sometimes buy a started mesquite sapling from a specialty garden store and nursery, planting seeds harvested from a tree is more budget-friendly. Harvest the mesquite seeds. The mesquite tree's blossoms develop into 2- to 6-inch pods that become dry and brittle in the late summer. Pick a pod that's firm and rattles when you shake it. Break the pod open to reveal the dark-colored seeds inside. Rub the seeds in sandpaper so the outer surface is scratched. This helps water penetrate the seed coating for faster germination. Stratify the mesquite seeds. This improves germination rates, according to New Mexico State University. Wrap the seeds in moist sphagnum moss and store it in a sealed container or bag in your refrigerator for eight weeks. Prepare a pot while waiting for the seeds. Use one pot for each seed you want to plant. Fill a standard gallon-sized pot with potting soil. If there are no drainage holes at the bottom, add 1 to 2 inches of gravel before pouring in the potting soil. Plant the mesquite seeds. Bury each seed 1/4 inch below the soil surface. Apply water twice a day or as needed to keep the soil moist. For best results, keep the temperature around the pot at 80 degrees F, according to the Texas A&M University. Transplant the mesquite sapling into the ground once it is 4 to 6 inches tall. Use a spade and dig a hole that's as deep, and slightly wider, than the size of the pot in which the seedling is located. Mix in a couple inches of aged compost to the soil to give the sapling a nutritional boost; mesquite are very hardy and need no additional fertilization. Slide the contents of the pot out of the pot and into the hole so it's resting upright. Fill in any open spots on the side with loose soil. It can take several weeks for the mesquite seed to germinate. Rabbits often enjoy chewing off the top of mesquite seedlings, according to the Texas A&M University. If rabbits live in your area, surround the sapling with chicken wire to keep the animals out. Wire that's 3 feet tall or higher will suffice until the sapling is 1 to 2 feet tall, after which the wire can be removed.